Alba Rosa Viëtor (1889-1979) was a renowned concert violinist, pianist and composer in her time. Her life covered three continents: she was born as Alba Rosa in Italy and spent her childhood in Milan, where she studied at the Giuseppe Verdi Conservatorio from her 8th year – as the youngest student ever. At the age of 12, she emigrated with her mother to Montevideo (Uruguay) in South America, but left after two years for Brussels to continue her violin study there. She lived in Buenos Aires (where she taught at the conservatory), in Vienna (where she studied with the famous violin pedagogue professor Otokar Sevcik) and in New York, where she married the Dutch businessman Jan Fresemann Viëtor in 1919. With him, she settled in North America and had two children. From an early age she started composing, but only when she terminates her career as a concert violinist and takes composition lessons, composing became the most important thing in her life. 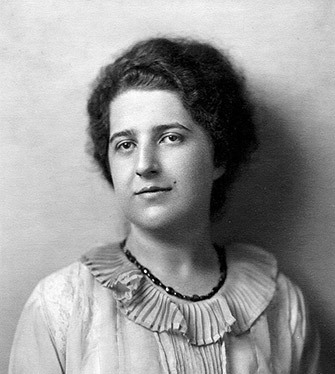 After her divorce, Alba Rosa becomes a member of the Society of American composers. Her works were performed by leading orchestras and musicians and reviewed by leading music critics. Thanks to her memoirs, published in The Story of Alba Rosa Viëtor: Violinist and Composer 1889-1979, we know what Alba Rosa Viëtor thought and felt. She did not feel in any way or form limited by the fact that she was a female composer. Until the beginning of the 20th century, there were not many women who composed, and those who did were in most cases concert pianists (such as Clara Schumann). Alba Rosa being a violinist, was clearly an exception. One does not get the impression that she felt discriminated or experienced any adverse reaction. Women’s emancipation did not interest her, on the contrary: she found the actions of the feminists, which she experienced when she was in London in 1914, somewhat exaggerated. Composing seems to never have felt as a big burden for Alba, something that was the case with some other female composers – especially when they were married to a male composer. Alba’s husband was even proud of her and encouraged her to compose. Many of her compositions were performed during her life in concert halls in North America. They were enthusiastically received and Alba often got better reviews than her male fellow composers. In 2010, the catalog was released, and since that time her compositions have been performed more regularly. A number of her works were also recorded. Recently, the historical recordings of performances of Alba Rosa Viëtor’s work (some of which were performed by herself) were transferred from 78 rpm records to CD. The Alba Rosa Viëtor Foundation has opened a website, posted an article on Wikipedia and made sure that all compositions are publicly available via Petrucci . More information on how to order the book can be found on this page.